UPM offers more than 400 fields of postgraduate study in its effort to transform Malaysia into a higher education hub of excellence at the regional and international level. 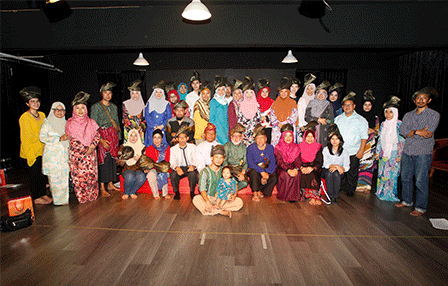 UPM constantly strives to produce well-balanced students from the academic and ethical aspects. 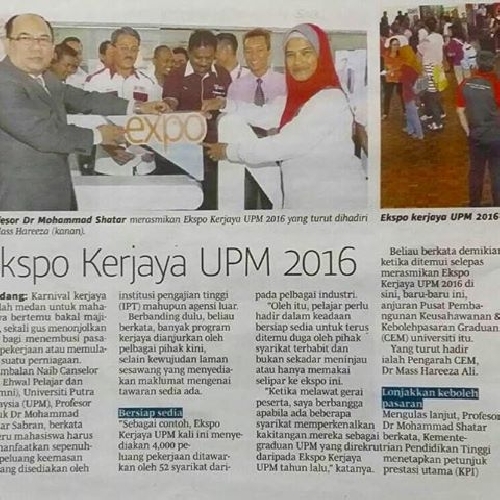 UPM currently has the highest percentage of academicians with PhD in Malaysia. It also provides a conducive environment and invaluable learning experience to its students from more than 60 countries. 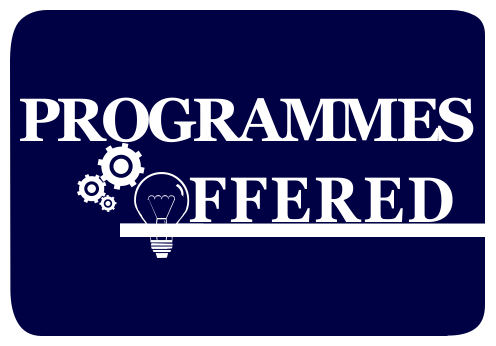 Those who are interested in postgraduate education programmes (except management) must submit their applications through the School of Graduate Studies (SGS). 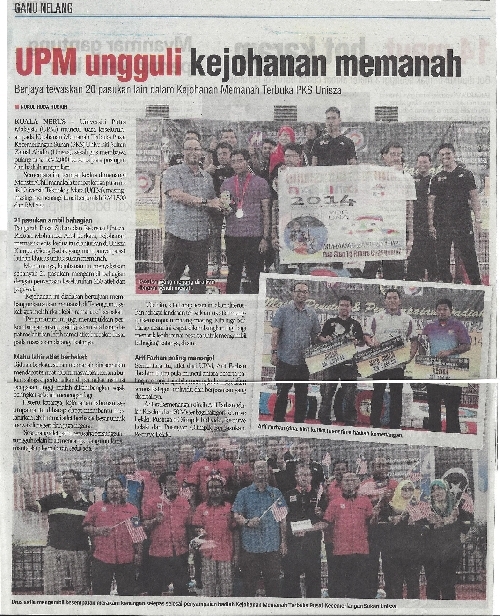 Your relationship with the UPM community does not end upon graduation. UPM graduates are welcome to join the UPM Alumni Association, which is dedicated to strengthening the bonds of friendship and networks from a variety of expertise. 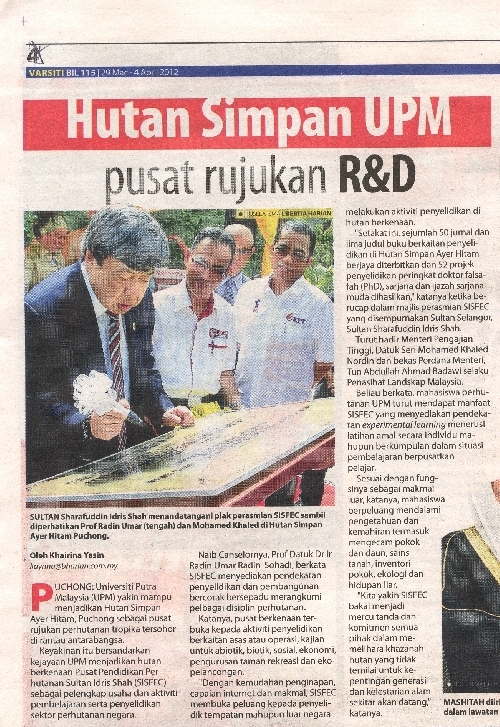 In fact, many members of the UPM Alumni have been appointed as ambassadors at large for their contributions in their fields, and they have left a big impact on society and the nation and enhanced the university’s reputation at the international level. 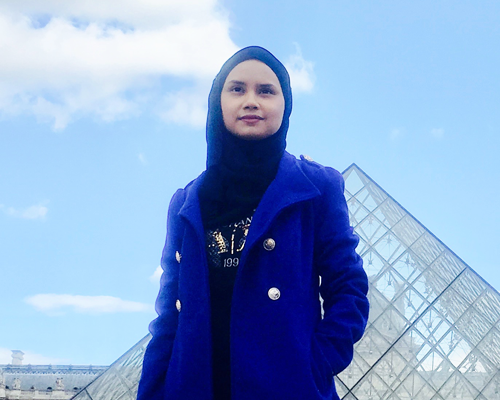 Since 1971, the UPM Alumni list has grown to an impressive list of 145,000 people - not only in Malaysia but from all over the world, including Australia, Iran, France, Myanmar and Saudi Arabia. 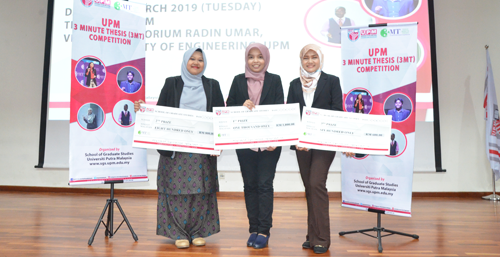 Armed with a desire to foster fraternity with their Alma mater, UPM Alumni have managed to share great ideas and speak critically for the development of a dynamic university in the realisation of our vision and mission. For those interested to find out more information about the UPM Alumni Association, visit the Alumni Centre and the Alumni Association Official Website. 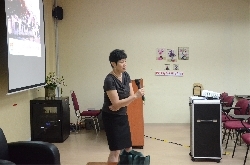 Alumni Centre has received courtesy visits from Alumni Office, Institute of Higher Education in Malaysia and International every year. Approximately 2-3 courtesy visits/delegates come from various Alumni Office such as Universiti Utara Malaysia, Universiti Teknologi Mara, Institut Pertanian Bogor and much more. As stakeholders, alumni also assist in outreaching to other stakeholders, namely, industries, friends of the university, and local or international organisations. 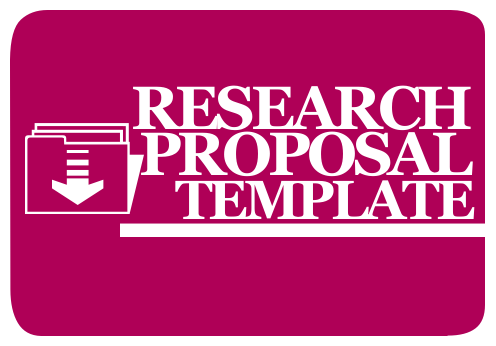 These stakeholders may have an interest in collaborating with their alma mater for academic, research and commercialisation purposes in line with the University’s strategic plans. 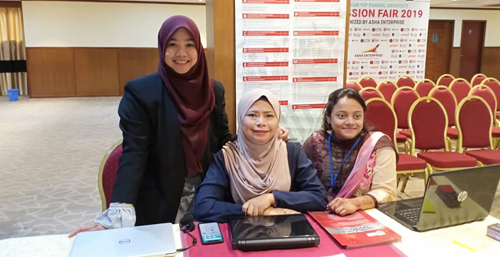 Alumni Centre acts as secretariat for Yayasan Pak Rashid to manage and assist in student scholarly development and to award medal and prizes ‘YPR Gold Medal Award’ to any outstanding students. 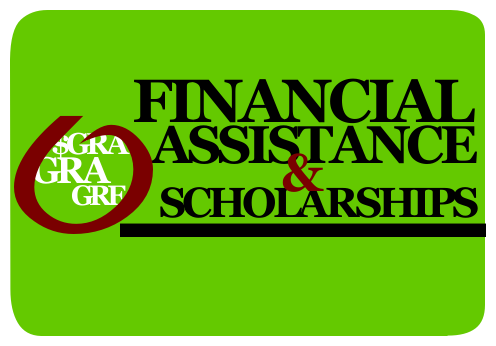 YPR also provides a financial loan to the student who needs temporary assistance to fund their study. Alumni Centre also manage Soh Kim Mee Scholarship that will be given to the Diploma and Bachelor Student in Agriculture programme. Signup for Alumni and UPM news. The School of Graduate Studies (SGS) is an administrative centre and a core support system which helps ease and enhance the postgraduate experience for UPM students and plays a crucial role in fostering the relationship between UPM and its graduates. 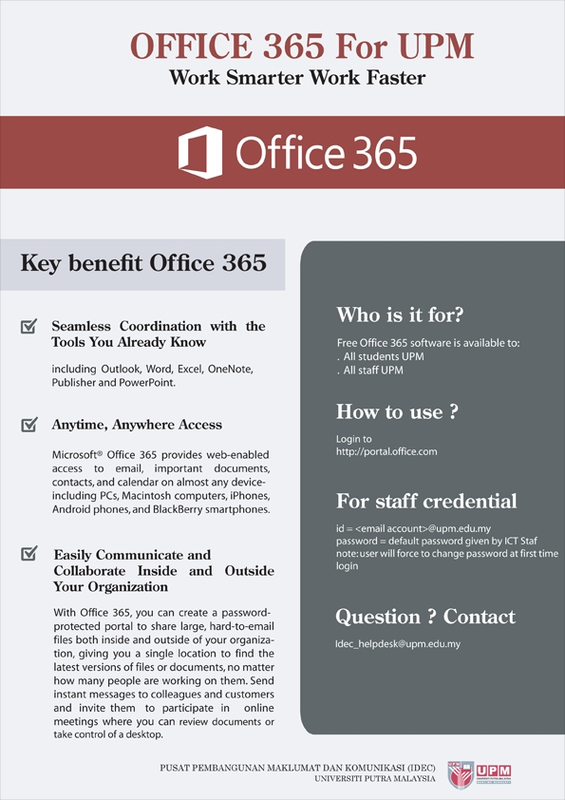 Go to the following links to learn more about SGS. School of Graduate (SGS) has received courtesy visits from various universities; local and international through out the year. 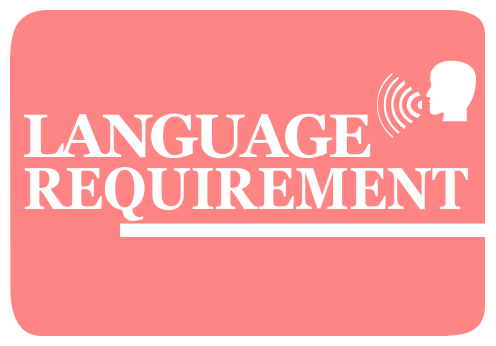 Study English at our ELS Language Centre. Click here for detail. 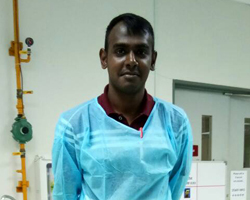 Kiven Kumar was ‘head over heels’ with Biology subject since he was in high school and was very much inspired by his science teacher, Mdm. 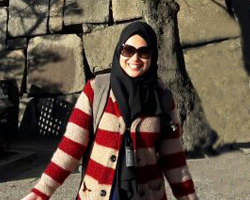 Ismaliza Ishak. He was an average high school student but with strong determination and consistent efforts, he managed to find his way towards achieving his goal. 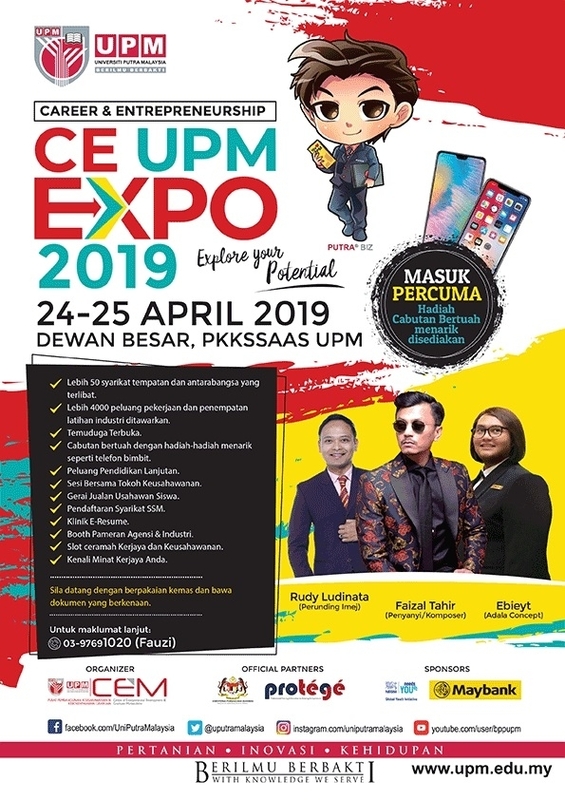 Universiti Putra Malaysia (UPM) recently participated in the Malaysia Top Ranking University Education Fair 2019 in Bangladesh with five (5) other universities (Universiti Teknologi Malaysia (UTM), Islamic International University Malaysia (IIUM), Universiti Teknologi Petronas (UTP), Universiti Selangor (UNISEL), UCSI University) to promote undergraduate and postgraduate programmes of respective universities. 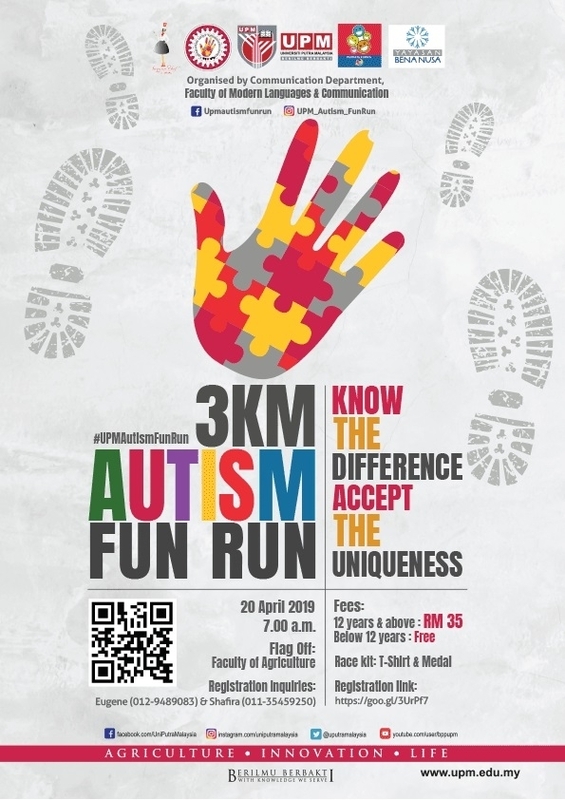 The event was held from 14 to 23 March 2019 in four cities – Chittagong, Dhaka, Rajshahi and Sylhet. 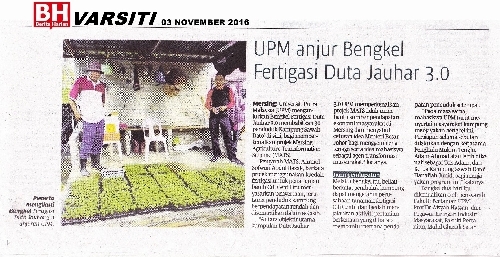 UPM booth was visited by approximately 100 visitors who were interested to pursue Bachelor, Master or PhD Degree at UPM. Majority of the visitors were interested in the fields of Computer Science, Economic, Engineering, English Language, Human Resource Development and Marketing. You are cordially invited to Putra International Centre (i-PUTRA) i-Putra Open Day. 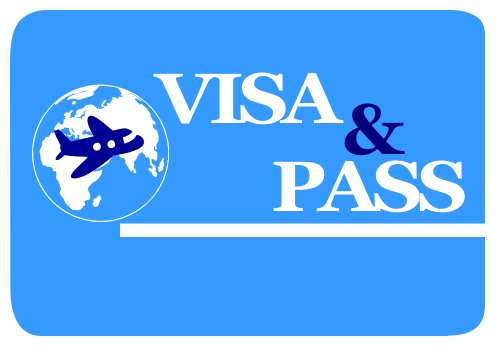 Be informed that our visa and pass counter service will be closed on our open day, thus please visit us at the above location for assistance. 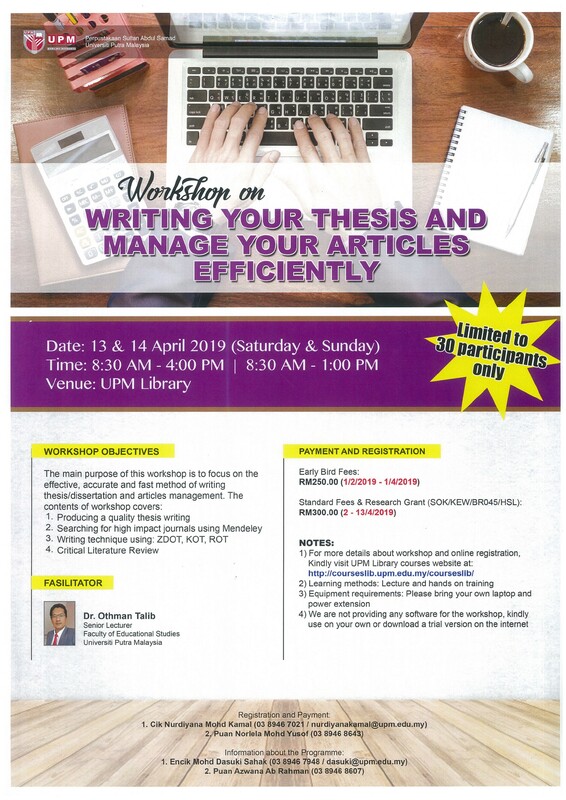 Please be reminded that students who are planning to submit their thesis by the end of this semester need to submit a hard copy of the GS-14a form to the School of Graduate Studies, Universiti Putra Malaysia at least three months before the intended thesis submission date. Therefore, we advise you to complete your GS-14a as soon as possible to prevent any unforeseen delays. 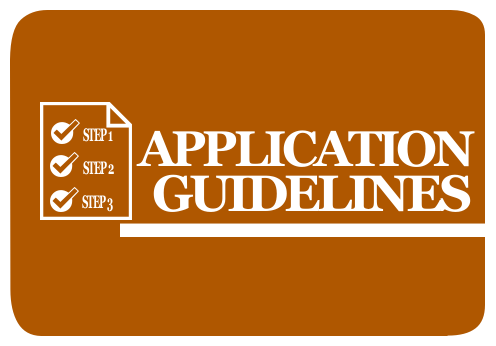 The process of nominating the examination committee can only commence after submission of the GS-14a to the School of Graduate Studies. 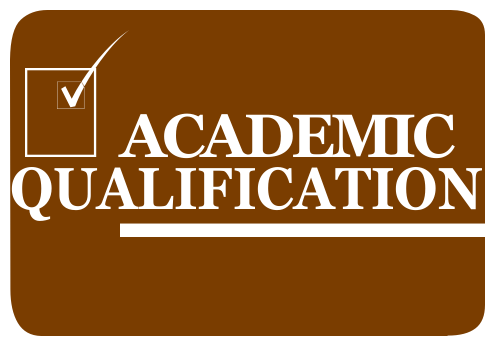 The examination committee needs to be nominated and approved at the Faculty level and The University Graduate Studies Committee. 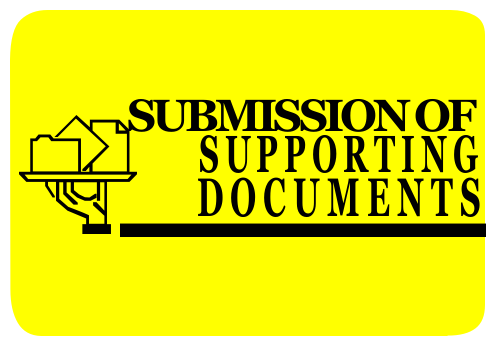 The deadline for thesis submission is September 9, 2019. 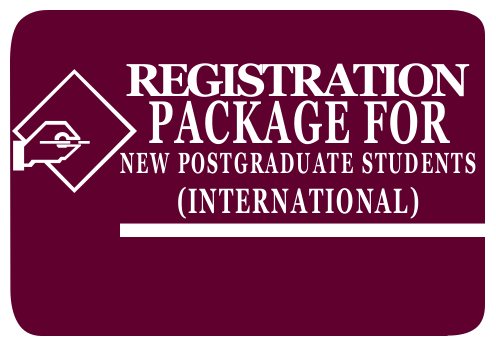 Students who meet this deadline are only required to pay RM400 (local students)/RM450 (foreign students) for the First Semester 2019/2020. No extension is given after the stipulated deadline. 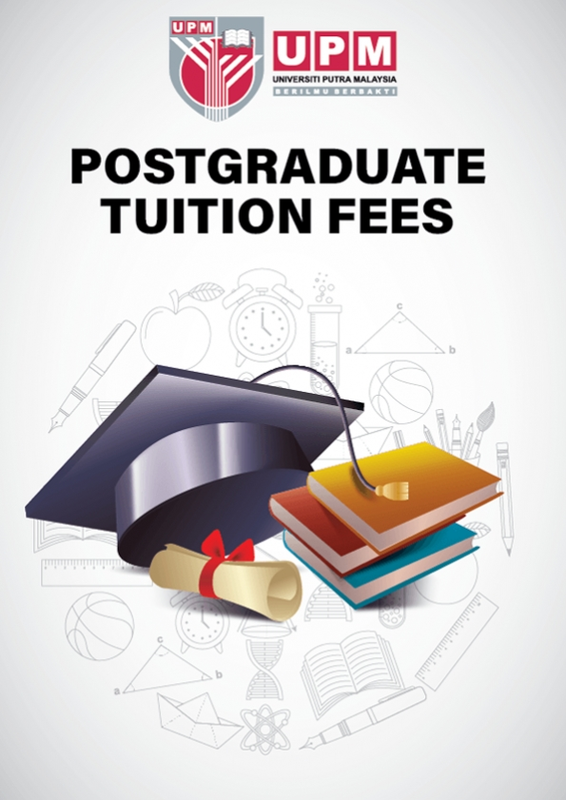 Full fees (for First Semester 2019/2020) are required after the deadline. 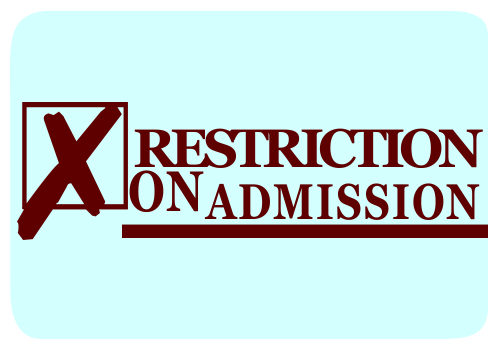 Thesis submission is not permitted if your registration status is ‘Probation’ (Not Satisfactory/TM), ‘Dropped’, ‘Defer’ or ‘Terminated’. 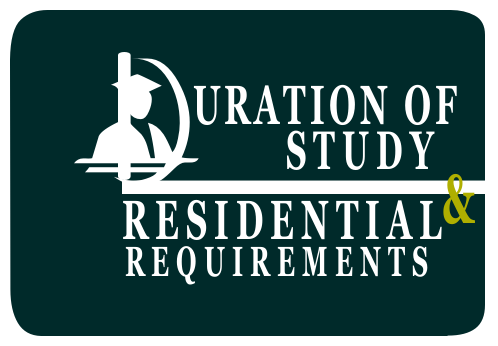 You will need to take action on your registration status before you can submit your thesis. 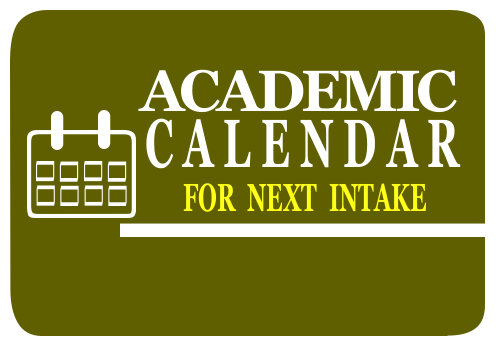 Students who are already at their maximum semester of study must submit their theses by no later than August 16, 2019. 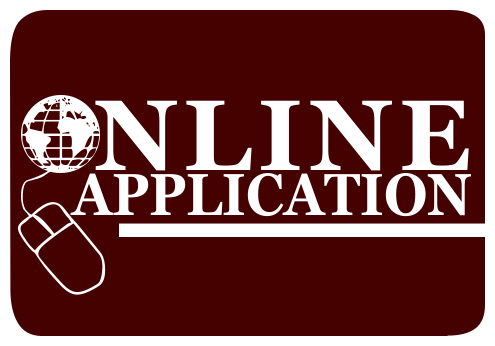 Students who do not meet this deadline will need to apply for extension of study through the student portal. Failure to do so shall result in a ‘Terminated (Exceeded Duration)’ status. 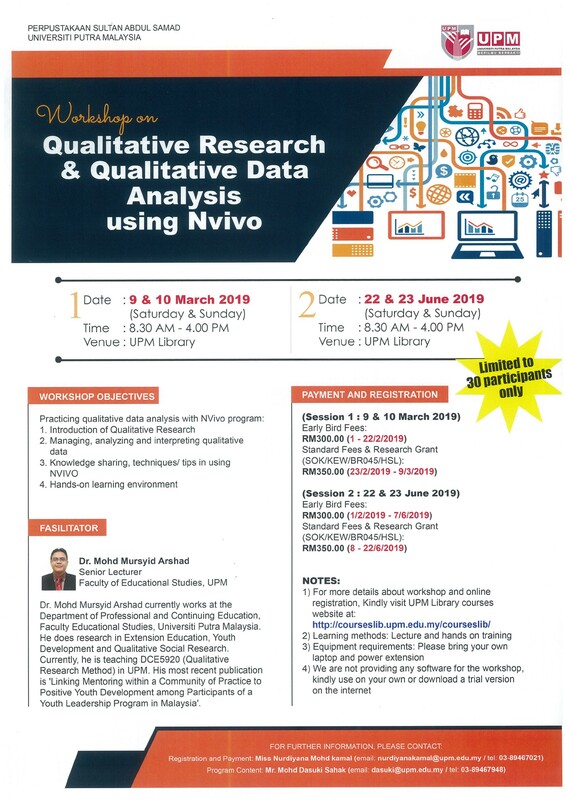 We are pleased to inform that Sultan Abdul Samad Library (PSAS) will be organizing research workshop on March until June 2019. 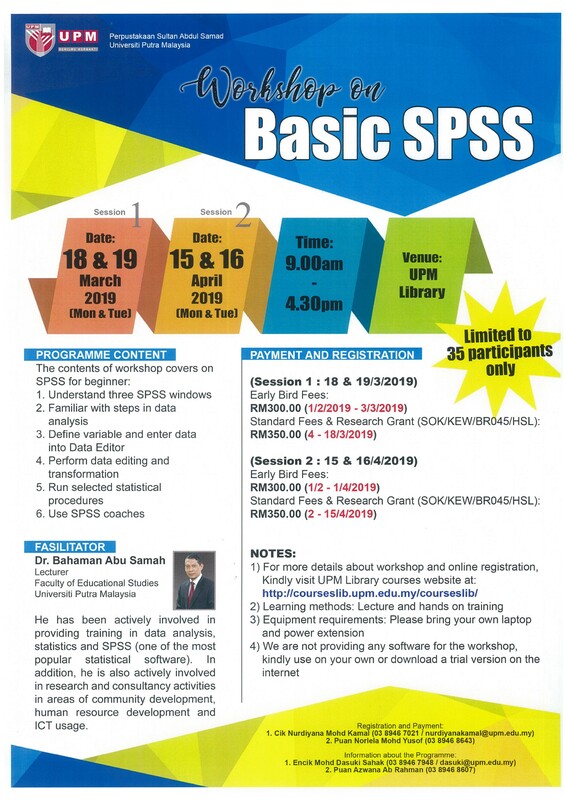 We would like to invite you to participate in this workshop. 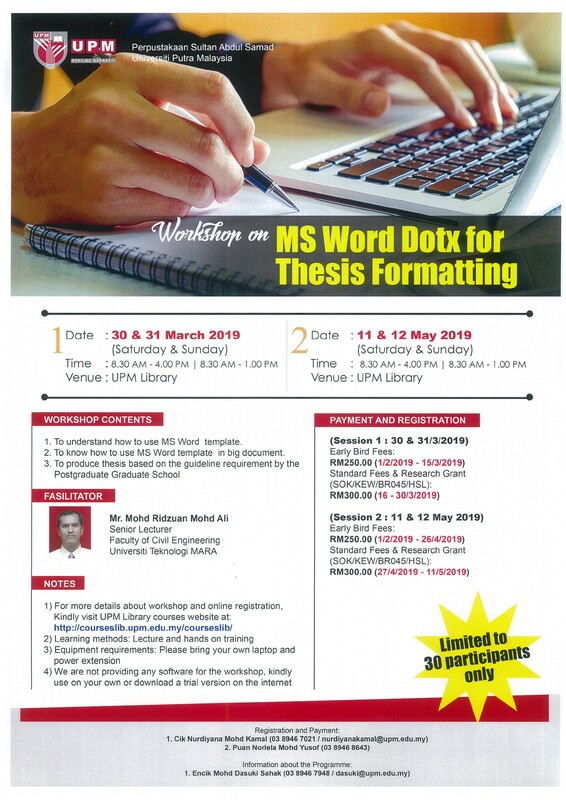 Below are the workshop posters for your reference. We would be appreciate if you could disseminate this announcement to your contacts or friends who might be interested to attend. 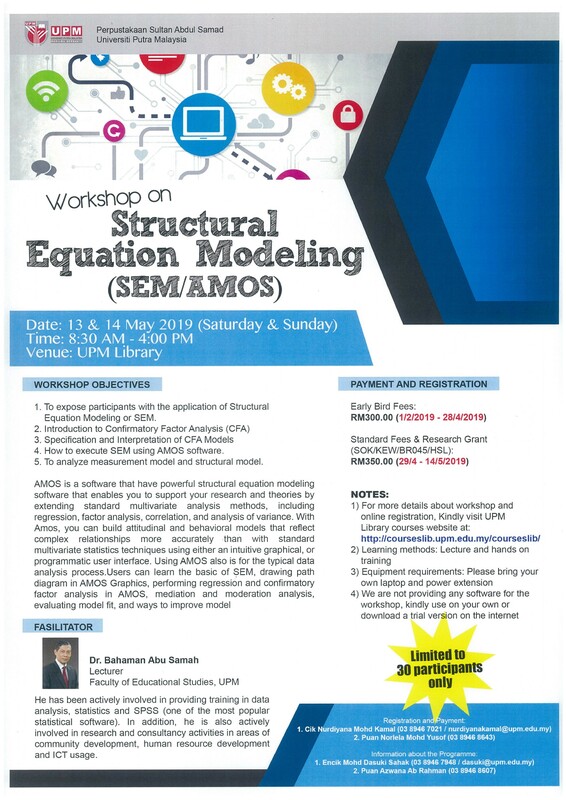 Should you have any further questions or wish to receive additional explanation regarding specific matters concerning these workshop, do not hesitate to contact En. 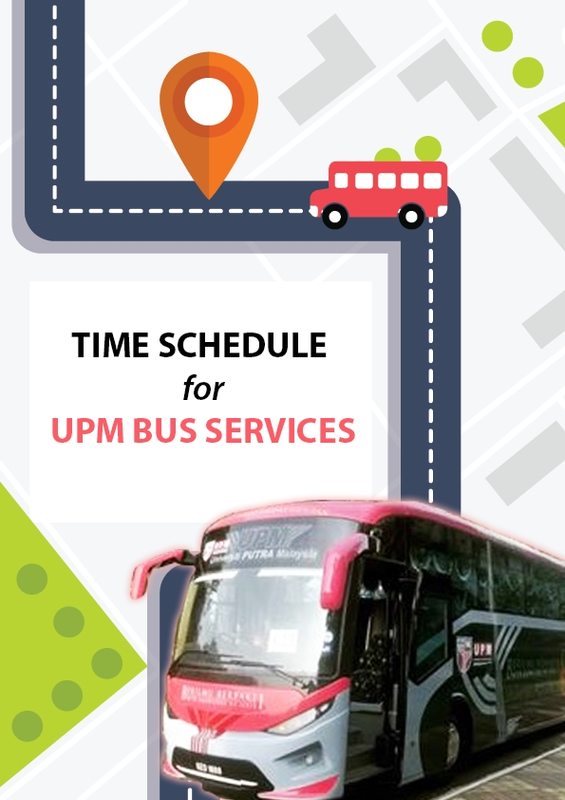 Mohd Dasuki Sahak/Cik Nurdiyana Mohd Kamla, Corporate and Training Staff Division at 03-8946 7948 / 7021 / 8643 or click to this portal http://courseslib.upm.edu.my/courseslib/. 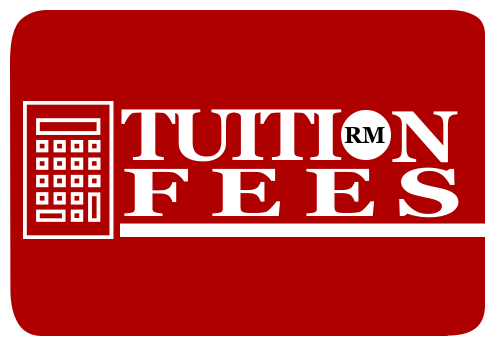 This new rate implies to all students and the increment shall reflect to the second semester 2018/2019 tuition fees onwards.